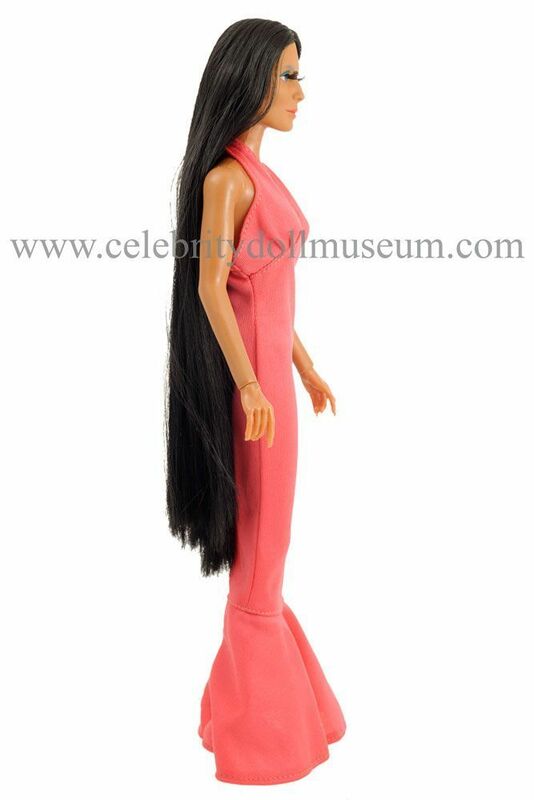 The Cher celebrity doll portrays her as herself from the Sonny & Cher TV series. It was made by Mego in 1976 in the The Mackie Collection Dolls series. This doll is the first of three versions (Growing Hair and bathing suit/hollow body Cher) made from 1976-1978. A full line of Mackie clothes, home and stage playsets, and a Sonny doll (Sonny Bono) were also made during that time. The dolls are over 12 inches tall. In 2007 Mattel made a series of Barbie Collector Series Cher dolls, some in extremely limited editions. 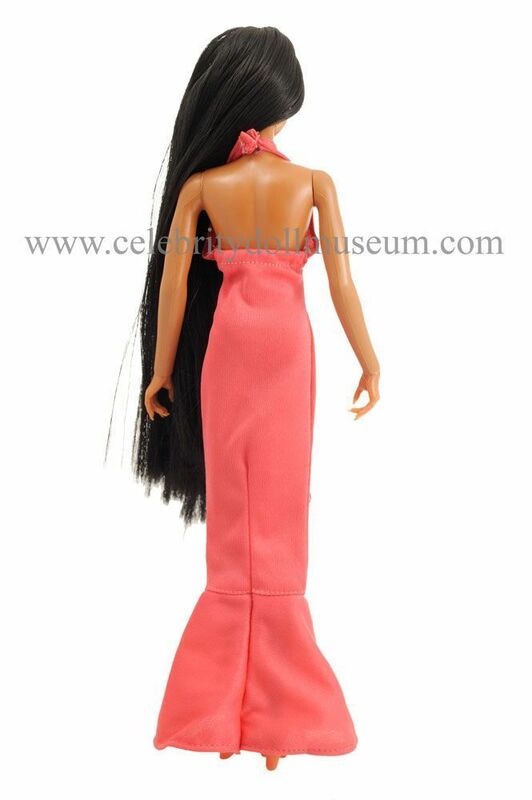 See Cher (2007) doll for photos and more information about the doll. 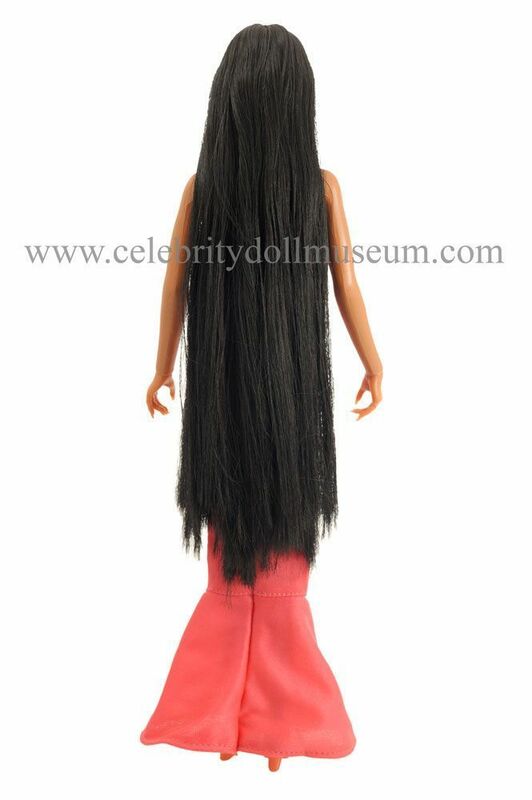 Cher is one of the exception dolls in the Celebrity Doll Museum with more than one doll representing a celebrity. Cher has an official website at www.cher.com and her forum under merchandising has some good posts where you can learn more about Cher dolls and other collectibles. This is a particularly good one on dolls. The 1976 version comes wearing a 70’s style salmon pink armless evening gown and chunky plastic pink high heels. The hair is straight parted in the middle and hangs down to her knees. 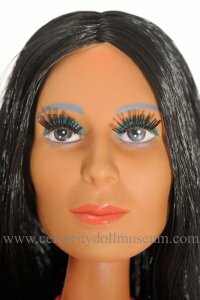 The stick out eyelashes, silver blue eyebrows, long unpolished fingernails, and very tan color are doll’s distinctive features. The knees click bend, head turns and tilts, wrists bend, arms are soft vinyl but do not hold a pose, and shoulders move forward and backwards. No other accessories came with the doll. 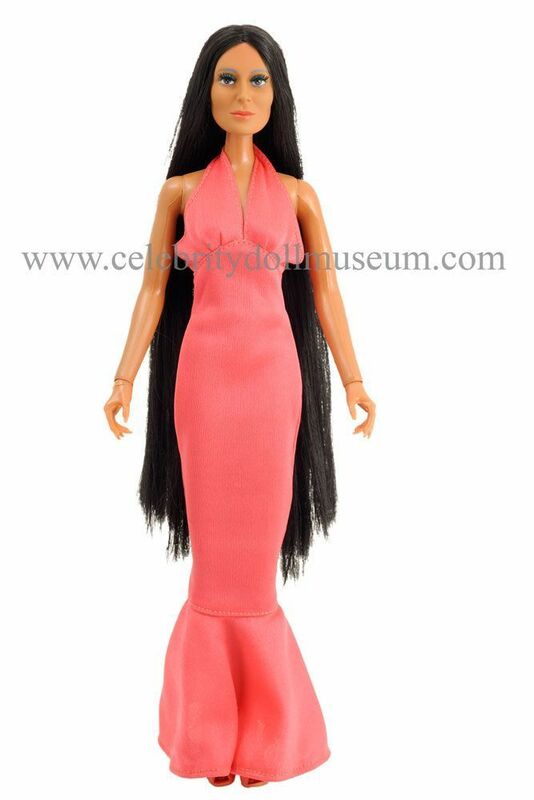 I have this cher doll & i was just wanting 2 know how much its . Thank u. How do I tell what year my doll was made in? Mine looks like this one if so how much is it? The 1976 Mego Cher doll’s bending elbows do, in fact, hold a pose. If the doll’s elbows no longer hold a pose, it’s due to age and playwear, which can eventually break the mechanism inside. I have over a dozen Mego Cher dolls, and about half of them still have working elbows, so she can hold her microphone closer to her mouth. I should clarify that a later Cher doll was produced by Mego, and was a cheaper version of the original vinyl doll. 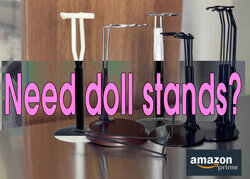 She was made a little bit shorter, with a hollow plastic body, legs, and arms. She did not have jointed wrists, and her elbows and knees did not bend. The body was the only thing Mego changed on the new doll, apparently to reduce production costs. They used the same vinyl head from the original doll, with identical hair and facial screening. This was not a Mego doll, but had the original Mego head. When the Mego company had money trouble, they sold their remaining Cher heads to a company which put the heads on a cheap hollow plastic body and they were sold as Cher dolls by that company. However, these were not Mego dolls.